Corner of Bay Street and King Street at dusk in the Financial District of Toronto at dusk. 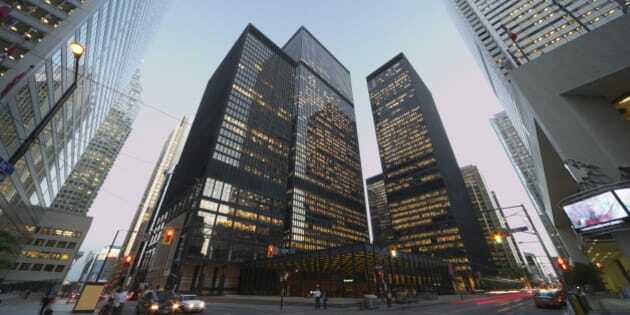 Toronto has risen into the top 10 on a ranking of the world’s most important financial centres. Canada’s largest city leapfrogged Chicago and Boston to become the second-most important financial centre in North America, according to the latest Global Financial Centres Index from Z/Yen Group and Qatar Financial Centre. Toronto now ranks eighth in the world, behind Zurich and ahead of San Francisco. “Toronto seems to get stronger and stronger. A number of our rivals have opened up subsidiaries there,” the survey quoted an unidentified New York banker as saying. Montreal rose one spot to 17th place, while Vancouver fell three spots to 18th. Calgary, at 39th, is the only other Canadian city on the 84-city list. London jumped over New York to become the world's number-one financial centre. Those two have been fighting it out for top spot for years, with Hong Kong rounding out the top three. The survey combines data from various other surveys to come up with five criteria for a financial centre: Business environment, financial sector development, infrastructure, human capital and reputation. Toronto scores highest on reputation, coming in at eighth place. Its worst score is on human capital, coming in at 11th. “The top financial centres of the world are very well developed, sophisticated and cosmopolitan cities in their own right,” the survey says.